If you already have some extra seeds to share, please bring them for other gardeners – and feel free to “swap” them for other seeds that you would like to plant.SPRING IS JUST AROUND THE CORNER! If you DON’T have any seeds to share, feel free to JUST COME GET SOME SEEDS. Trade in your (good condition) clothing for something new and fabulous! Community Care Collective will have a Clothing Swap Saturday, 22 July from 12-5. We will be taking donations of clean, good condition casual, professional, fancy, and costume clothing during regular business hours Tuesdays through Saturday until then. Call/ Text Crow at 720.663.7194 if you have questions! 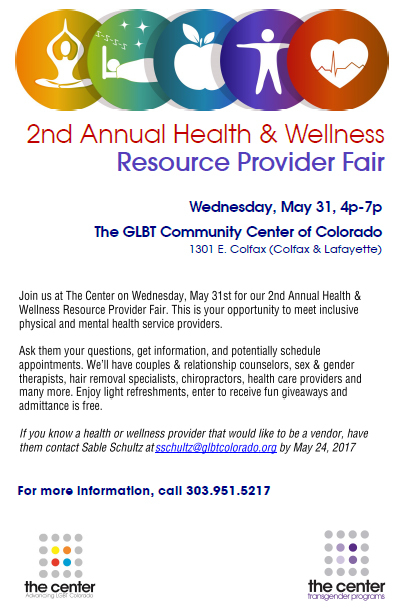 ~ 2017 HEALTH PROVIDER VENDOR FAIR: The LGBT Center of Colorado is having a Health Provider Vendor Fair. If you or someone you care about is looking for safe and competent health resources, please come to this excellent and informative event. And of course, stop by our booth to say Hi and find out what we can offer! 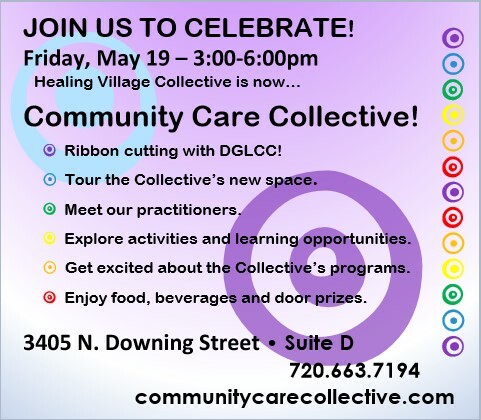 ~ Open House: Celebrate with us! We have a new name – Community Care Collective – a new space, and a new model with more to offer! !